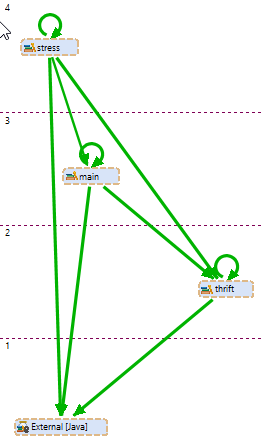 Showing levelized content is a unique feature of the Graph view in relation to other views in the application. When a Graph view is requested, Sonargraph organizes nodes in a way that given each edge of the graph and both From and To end-points of the edge, the From end-point will always be in a greater level than the To end-point. This way of layouting immediately gives the user an idea of how strong or weak is the coupling among the selected elements that form the content of the view and how modifications will impact elements that belong to different levels.